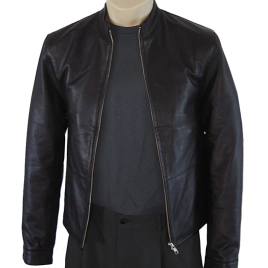 A mid-weight leather jacket, this would be best suited to spring or fall wear. Simple and minimalistic in design, it has a futuristic elegance, without being too 'other worldly', and a garment which can easily be worn with most contemporary clothing (although not shirts with high collars...) Another aspect of the simplicity of the design, is it's understated appearance. It is not something which screams out for attenion, but quietly announces itself to those who would recognize it and its screen origins. The leather is a perfect match to the screen original, and is soft and supple making the jacket incredibly comfortable to wear. Interior pockets enable items to be carried without marring the lines of the garment.